To give the full scoop, I have to take you back to September 2014. I remember the day so clearly. It was Friday, September 19th. I had to be up and to the airport to catch an early morning flight to Ft Lauderdale for a work meeting. Immediately after arrival, the team headed to a coffee shop to start our day. It was an exciting day … this was my last team meeting … my chance to say farewell to a group I had been working with for 3 years … I was about to embark on a new adventure! … and that’s when IT happened! The most excruciating pain I have ever felt! I couldn’t move. I couldn’t stand. I couldn’t sit. The entire right side of my body was paralyzed! I needed help but couldn’t walk to the door. I managed to lower myself to the floor and wiggled my way to the door. I got it open and two gentlemen saw me lying on the floor. They rushed to my aid while shouting call 911. Paramedics and fire department arrived within a few minutes. They asked a battery of question and I provided a detailed account. The pain had disappeared before they arrived. I was finally able to move my leg and arm. I kept thinking … I’m so glad I didn’t have my pants pulled down! Since the paramedics couldn’t determine what was wrong or what happened, they whisked me away to the nearby hospital. An x-ray, blood work and an ultrasound later, I was released without definitive answers. That’s right, no answers. How could there be no answers?!?!? My mind whirled as I made my way home. I had so many thoughts I didn’t know what to think. As the new week approached, I was glad to settle back into my regular routine. Then, IT happened again!!! It was early Sunday morning – nine days after the initial incident. I was awakened by excruciating pain that completely paralyzed the right side of my body. I couldn’t move. I didn’t know what to do. I screamed for my daughter. She ran to my rescue but didn’t know what to do. After many agonizing minutes, the pain vanished. I spent the rest of the night fearful IT was going to happen again. IT didn’t happen again. However, I had numbness in my right arm and leg that didn’t go away. In addition, I developed dizziness whenever I moved my head. I felt like a complete mess! I was on edge – almost anticipating the next time IT decided to make an appearance. Fortunately, I had an annual physical already scheduled for October 27th. I detailed everything that had occurred over the previous month. He ordered an MRI of my lumbar spine thinking I may have a pinched nerve. He determined the dizziness was positional and ordered PT to help resolve. MRI day arrived. As I was getting dressed and ready to leave, I was having difficulty walking. My gait was awkward. I was bumping into furniture and walls. I felt as if I was drunk. Something was wrong and I wanted to find out what it was! I made an appointment to see my primary care doctor that afternoon. Before I left the house, IT happened again! I was home alone. All I could do was wait for the pain to disappear as I laid on the floor. I finally made it the doctor office. After a quick neuro exam, my doctor indicated he wanted me to see a neurologist due to the unsteady gait and unexplained numbness in my arm and leg. He determined the IT was a severe muscle spasm. The numbness was getting more and more uncomfortable. It became so unbearable I went to the emergency room. I thought I would get some relief. I didn’t. In fact, the ER doctor spoke to me like I was an idiot. She did order a brain CT scan which didn’t show any abnormalities. I was released with prescription for a muscle relaxer and a pain reliever. IT happened again! I couldn’t believe it! This time I felt the pain (spasm) in my abdomen as well as in my right leg and arm. Just one more day until the neurologist visit … I felt some hope that I would finally find out what was happening with my body. The day finally arrived — the day I got to see the neurologist, Dr S. I was determined to get to the bottom of IT. Dr S was pleasant and attentive. After many questions and a neuro exam, he told me he was quite certain the IT was MS!!! More testing had to be done for confirmation. My head was reeling! 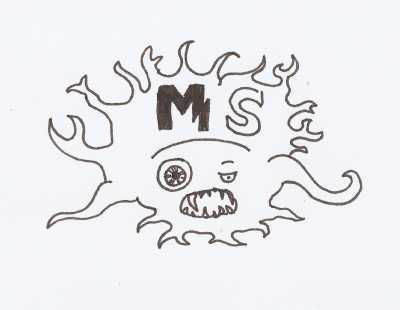 MS? HOW COULD THAT BE?!?!? I quickly pushed that thought out of my head. There’s NO WAY I had MS. I wasn’t going to have any part of that diagnosis. NO WAY!!!! I woke with weakness on the entire left side of my body. My arm felt as if it had been “asleep” and wasn’t waking up. It took great effort to move my arm. The numbness was still present in my right leg and arm. My gait was still unsteady. In fact, it had gotten worse. In order to walk, I had to brace myself with furniture, wall or support of someone. I spent the morning wishing all of it to just go away. I knew I had to seek medical attention. I feared I was having a stroke. Fortunately, the attending doctors were much more attentive. They did several neuro exams and ordered another brain CT scan. IT happened just as the CT scan was about to begin. Finally, someone witnessed IT. The radiology tech was at a complete loss as to how to help. He didn’t even report it to the ER nurse upon my return to the ER holding area. There it was again! MS!!!! I couldn’t believe they would actually say that without conclusive evidence. Were they trying to scare me? My first night in the hospital was uneventful and un-restful. I was anxious to get the testing underway. I desperately wanted to know what was wrong with me. Approximately 10 AM, IT happened. My daughter was in the room when it started. I told her to get my nurse. The nurse witnessed most of it. I was relieved someone saw what had happened and could relay the information to the attending neurologist, Dr K.
A neuro exam by Dr K resulted in several new medications and many diagnostic tests being ordered – blood work, MRI’s of brain, neck and back, plus a lumbar puncture. Due to the weekend, I’d have to wait until Monday. Another delay! IT happened again!!! 10 AM. The intensity and duration of the spasms seemed to increase. The pain was unbearable. I spent the next several hours having the three MRI’s – with and without contrast. That was an experience. I was trapped in the small, loud machine for what seemed like an eternity. Upon return to my room, I had to lay flat for several hours to avoid a getting a headache. The waiting and not knowing what will be happening next kept me on edge. Everything was completely out of my control. By mid-afternoon, the results were in. All of the tests confirmed what I dread most … MS … Multiple Sclerosis. Dr K explained there were lesions on the nerves in my head, neck and back. The lesions are the result of the immune system attacking the myelin sheath of nerves. Dr K mentioned there have been many advancements in the treatment of MS and suggested a medication to slow the progression of lesion development. He, of course, recommended I research all MS medications. One of the new medications ordered was a high dose (1000 mg) of Solu-Medrol via IV. I was told this medication help with the nerve inflammation which was causing the spasms, or attacks. I was told they were going to keep me at least another night to monitor me. I was a complete mess! I felt completely alone despite my daughter and my mom at my side. I prayed for peace and comfort … and faith that God would take this horrible disease from my body. The next day, I had two more attacks prior to discharge. I was beginning to have serious doubt the attacks would go away. The resulting pain in my right thigh was nearly unbearable – even to the slightest touch. To help alleviate spasms, the muscle relaxer Tizandine was introduced. The final three Solu-Medrol doses were completed. I felt as if things were getting back to “normal”. We opted for a second opinion. I went back to Dr S. After reviewing the MRI results, he confirmed MS. He recommended I see an MS specialist – Dr C. The nurse for Dr S indicated she had to compile all of my records, send to Dr C’s office for review and then if he felt he could help me, his office would call. It could take up to 6 weeks to be called! We decided to go to Dr K, the neurologist who saw me in the hospital, to begin a treatment plan. After researching all the medications and side effects, I decided on Aubagio. The side effects seemed less severe except for potential hair loss. Unfortunately, additional testing needed to be done before starting the medication. ARGH!!! Another delay!!! I was frustrated. I felt lost. No one was helping me. I wanted someone – a coach or an advocate – to help guide me through this new diagnosis. The doctors and nursing staff were ineffective. It seemed as though I was a nuisance and they didn’t want to be bothered. Why couldn’t they be more understanding and more accommodating? In a period of less than a month, the mysterious IT turned my life upside down. I was ready for IT to go away!